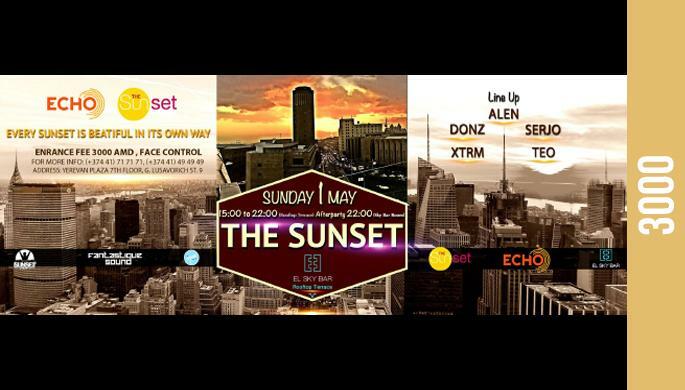 We are glad to represent you the new project "ECHO" and first party at the most popular rooftop terrace "THE SUNSET". This SUNday hanging starts at 3PM. Each person will receive FREE DRINK until 4PM! The best DJs will have performances all day long with cool suny sets exclusive for our project. So you'll get an opportunity to have a great time at fabulous OPEN AIR place drinking your favourite DRINKS and listening awesome MUSIC. And than we have AFTERPARTY of course inside one of the best clubs of the downtown.